This medication is Old Faithful. It started its illustrious career as a lowly rat poison but has reached heights that it never imagined. It is the blood thinner that patients are most curious about. Dosing is once daily, it has been available forever and we understand how to use it. Five decades of use have proven that this vitamin K antagonist reduces the risk of stroke in patients with atrial fibrillation. 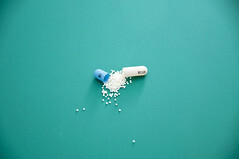 Unfortunately, warfarin is very finicky and can be difficult to find the correct dose for you. The target range of effect is very narrow which further makes dosing difficult. If you blood is too thick, you are not fully protected from stroke. If your blood is too thin, your risk of bleeding is higher. You will need frequent checks of your INR (a blood test to follow the blood’s thickness) to make sure that you are within range. There is no doubt that the third, fourth and fifth decades of life are a crucial and important period of life when it comes to our health and well being. This is the transition stage from youth to our senior years and what we do during this time plays a huge part in determining how we will spend our future years. The way we treat our bodies during this crucial period will help determine whether we get to spend our later years enjoying the retirement we worked our whole lives for, traveling and playing with our grandchildren, or instead plagued with disease and their complications and forever struggling to maintain our independence. The sad fact of matter is that, as doctors, whereas we used to try to prevent people from developing chronic disease in their fifties and sixties, we now find ourselves diagnosing people younger and younger and having to tell them that they may not see their children graduate college, never mind hold their grandchildren. This has been as a result of growing levels of obesity, physical inactivity, smoking, and not taking responsibility for our own health. Although it is never too late to make a difference to your health, it is still the fact that the earlier we intervene the greater the benefit and nothing is more true in this instance than the age old saying ‘prevention is better than cure’ (although in this case treatment is probably more fitting as there often is no cure!). As we pass our mid twenties and begin to approach our thirties, life can start to change rapidly. We may enter a stable job, get married and start a family. All of a sudden we go from a more carefree existence to one where we have responsibilities and other people to take care of. Work or careers can take the front seat and after attending to family commitments and other necessities, what little ‘free’ time we have left is spent trying to expend as little energy as possible. This period of life can creep up on us and before we know it we find ourselves asking ourselves what happened to us? Time and time again I am faced with patients in their early forties entering my consulting room asking me what they can do to try to regain control of their deteriorating health and wellbeing. I am not sure what it is about turning forty, but it definitely seems to be a period of realisation for many people. Of the people I do see, some will listen and make a change in their lives, whereas others will simply slip back into their old ways unaware that they will find themselves back in my rooms in ten years time, only this time for a diagnosis not a check up. As I mentioned earlier, there is a great deal we can do for someone who presents in their forties, but if they had realised what was going to happen to them ten or fifteen years earlier, things would have been a lot easier. It was previously thought that we were fairly healthy and invincible in our adolescence and twenties and only later in life would our body begin to become susceptible and succumb to the changes that lead to chronic disease, but research, medical science and epidemiology has now revealed that the changes that lead to our developing these diseases can begin in our teenage years. This is a scary notion. The very things that will kill us or take away our quality of life in our later years are already developing whilst we are at school. There are many diseases that can affect us, but the main ones that are responsible for afflicting large numbers of the population are obesity, diabetes, coronary artery disease, hypertension (high blood pressure), chronic pulmonary disease (including emphysema), chronic kidney disease, peripheral vascular disease and cerebrovascular disease (cause of stroke). This looks like a long and scary list, and it is! Each of these diseases can be developing in us without any symptoms whatsoever, and when we finally realise, it is all too often too late. This is one of the most scary things about chronic disease. There can be no symptoms, signs or indications that anything is wrong. We can float through life feeling fine and remaining blissfully unaware that the way we are choosing to live is harming us from within. One of the biggest factors that leads to the development of chronic diseases is OBESITY. This is the biggest health problem we face in modern times. The population is getting heavier and heavier each year. Obesity is dangerous because it leads to so many different health problems. Amongst other things, being overweight increases the risk of developing diabetes, heart disease, stroke, high blood pressure and skeletal problems. We do not currently understand all the intricate mechanisms by which obesity damages our body, but what we do know is that it definitely does. The current school generation is suffering from an obesity epidemic in their teens, but for those who were at school prior to a decade ago the situation is somewhat different and needs to be addressed separately. This generation grew up in an era where the obesity epidemic was in its infancy. Most people were not overweight and remained this way after they left school and well into their twenties. Physical activity levels were much higher as computers and TV played less of a role in peoples lives, and although many calorie rich and fast foods were around, availability was much less. For this generation the problem is that obesity has slowly snuck up on them and incorporated itself in such a way that that it remained unnoticed for years to decades! To understand why this happened we must explore how it is that people gain weight. This is actually a very interesting topic and the answer is not what most people think. If you have read my previous articles (such as Why we gain weight, What’s in my food?) you may already have an idea, and if you haven’t then I suggest you do as the information is very important. To explain why the general population gains weight over time I will use an example of a patient I saw a few days ago. I use him as he is a typical representation of what is happening in the population. He is 45 and came to me concerned about his weight. To begin with I asked him to stand on the scales, and he weighed 94 kg (207 lbs) standing at 5’6” tall. I asked him why he had come today and he told me that he was looking through his old wedding photos (aged 27) and was shocked by how different his body was then when compared to now! I asked him how much he weighed then and he told me he was 76 kg (162.8 lbs). The interesting point is that he had never before in the past 18 years realised how much he was changing. He was truly amazed that he has put on 18 kg (40 lbs) and never even really noticed. I asked him what he thought about why he had put on so much weight over the years, and his answer was the same as so many people think. He felt that he must have just been eating too much every day over the years and that this resulted in a steady weight gain. Whilst it is true that he probably had been eating too much on a regular basis, this in not in fact the reason he went from 76 kg to 94 kg over 18 years. 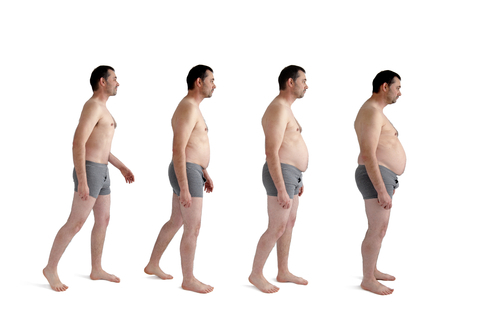 If you have read my article on energy balance and why we gain weight you will know that the human body is remarkable at keeping itself constant. The body loves to stay the same and always tries to do so. If we overeat by a small amount for a few days the body’s response is to reduce the appetite and under eat for similar period. The differences are so small that we barely notice them but they are certainly occurring. Even if your diet consists of junk, you reach a stable weight despite the fact that you are still eating junk and remain there. The result is that over time we balance our eating to maintain our weight, and if you look at population studies it is quite clear that the weight of the population as a whole remains constant throughout the year. So by now you are probably thinking if we don’t gain weight throughout the year, how has my patient gone from 76 kg to 94 kg!!! The answer is that he has done it in very small, but consistent bursts. When scientists actually sat down and studied people’s weight over years, they realised that people didn’t gain weight steadily, but instead put on the weight over very specific periods of the year. What people were doing was eating relatively consistently over the year, but then overeating by a significant amount over important occasions such as thanksgiving or christmas before returning back to their normal eating pattern after. The level of overeating was too overwhelming for the body and as a result it just gained weight and was unable to compensate. After the period the body was once again able to regain control stay at the new weight until the next period of overeating. The weight gain was so small (often less than half a kilogram) that the person wouldn’t even notice. This pattern would be repeated year after year and the person would gain on average 1 kg (2.2 lbs) per year. This may sound like a small amount but when you add it up year after year it becomes substantial! If you now look back to my patient you will notice that he only gained on average 1 kg per year, but over time this resulted in a massive 18 kg!!! Each gain was so small that he never even noticed until one day when he compared the beginning and end result. So the problem is that people tend to let themselves go when it comes to eating once or twice a year and gain a small amount of weight, but as they don’t realise they make no effort to try to lose it. This results in a gradual increase in weight over the years. It is very demoralising when you find yourself 20kg heavier than you should be and losing it can be very difficult and requires time and discipline. The earlier one realises what is happening the better and easier it is to reduce and control. I want people to realise that by simply making the effort after each period of eating (usually only twice a year) they can prevent the massive weight gain that accompanies it over time. The reason understanding this is so important is because one reason people don’t try to control their weight is that they think it will be too hard to permanently change their eating habits. If however they realise that one or two small weight loss efforts a year can result in a stable weight then they will be a lot more inclined to do so and the result will be a vast improve in their health. The reason I have placed so much emphasis on obesity is that this is one of the main drivers behind the development of chronic disease and especially diabetes! The prevalence of diabetes is constantly increasing and the age of diagnosis is becoming younger. As a doctor I hate nothing more than diagnosing someone, especially those who are young or have young families, with Type II diabetes. They will often come in feeling fine with no symptoms but leave having been told they will likely develop heart disease, stroke, kidney disease, blindness, neuropathy and many more awful conditions. When they ask what they can do to stop these things happening I have to tell them that diabetes is generally irreversible (once past a certain threshold) and that all they can do now is damage control. Time after time I see people who wish they had realised earlier and taken steps to change their life whilst they had the chance. Obesity is a huge problem and is the most concerning issue that is threatening the health of the developed world (and more increasingly developing nations!). It leads to a vast array of health problems and markedly increased mortality (death) and, possibly even more concerning, morbidity (as this means more years of your life are spent in poor health). It is during the years that people think they don’t need to worry about their health that lots of the damage is done and by the time they realise, it is often too late. Understand why we gain weight and take the steps to rectify it early and you will reap the rewards in the future. Unless otherwise stated, any stress test referenced on a MyHeart related blog post will refer specifically to cardiac stress tests. 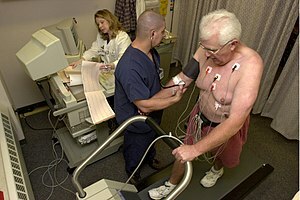 Other heart related stress tests like cardiopulmonary exercise tests can be discussed at a later date. In generic terms, a stress test is a procedure to indirectly determine whether there are significant blockages in your coronary arteries. Your heart arteries will not be visualized in an isolated stress test. The goal of stress test is to identify regions of heart muscle that are starving for adequate blood flow, also called ischemia. Your physician will have several different ways to achieve this goal but all commonly used stress methods can be categorized under to broad categories. The end result of these two broad categories, increased blood flow to your hearts arteries (or sometimes lack thereof), is the key to diagnosis. The heart is the powerhouse of your body. With stress tests that increase the heart workload, the heart is forced to pump more blood each minute than at rest. The same way that your body is fueled by food, your heart is fueled by blood (queue the obligatory True Blood reference). Blood supplies nutrients such as oxygen, glucose and fatty acids to the heart. If there is a blockage in one of your heart’s arteries then any portion of your powerhouse supplied by that artery does not have access to adequate energy to perform. This results in electrical and mechanical changes that we can detect. We will discuss some of these methods in future posts. There are two main ways that we increase your heart’s workload. The first is via exercise. The most popular method of exercise stress in most places is via the treadmill. Many physicians love exercise stress testing either alone or in conjunction with imaging as a stress modality of choice because it serves not only to stress the heart but also provides powerful additional prognostic information. Some places prefer to use a bicycle ergometer but the same principle applies. For those that are unable to exercise adequately a pharmacologic or medical stress can be used instead. Intravenous infusions can simulate the effect of exercise on your heart. Dobutamine is a catecholamine that works a bit like adrenalin. It increases your heart rate and can be used in lieu of exercise. These methods of stress are versatile. As mentioned above, when the heart rate increases sufficiency, regions of heart muscle without sufficient blood flow will struggle. The temporary changes have a formal name called ischemia. Ischemia is similar to the process that happens during angina but it takes place under safe, controlled circumstances. Active ischemia can be detected by electrocardiogram (ECG a.k.a. EKG), echocardiography, nuclear perfusion imaging, MRI perfusion imaging and CT perfusion imaging. The second broad category of stressing can be considered vasodilator testing. Vasodilators are another type pharmacologic stress agent that work differently than dobutamine. Stress vasodilators are based around adenosine, another one of the body’s miracle substances. These agents may increase heart rate to a degree but their main action is to dilate the coronary arteries. 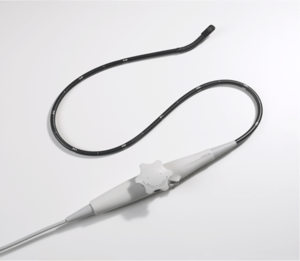 Normal coronary arteries can drastically increase blood flow when dilated whereas diseased vessels are much less capable. Perfusion imaging uses these differences in blood flow with vasodilation to its advantage. 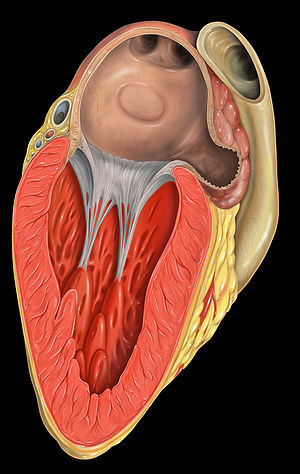 Blood flow in the heart muscle is then evaluated either by direct quantification or by comparison to surrounding muscle. 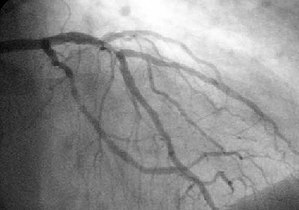 When perfusion imaging is used in conjunction with vasodilator pharmacologic agents, your doctor will be able to identify muscle that is supplied by a severely diseased coronary artery. 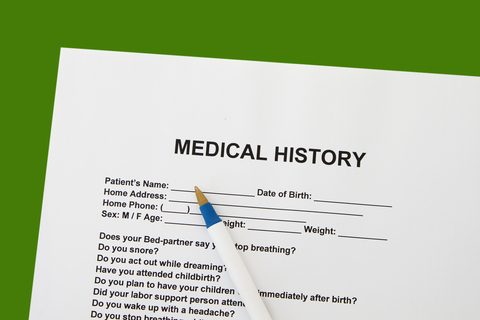 You should discuss with your health care provider what medicines should be withheld prior to your stress test. Some agents like beta-blockers and certain calcium channel blockers may prevent your heart rate from increasing adequately and can make workload-type stress tests difficult. If you are having a vasodilator stress test you should withhold caffeine for several hours before hand. If you have active asthma or COPD then these medications may incite breathing difficulties. If you think you are having a heart attack or are having active chest pain, stress testing in any form is probably not the best idea.